I would write more, but I’m trying to move a bunch of images over to my new photo frame (I never thought I’d want one of those until I just started thinking about it. And because all the pictures I have at work are old and it’s just way too much effort to print some to take in to work to replace in my frames. Now I just replace the files in my frames! Brilliant! Oh, so you are probably wondering what I did on the days leading up to today (which, by the way, is a let down compared to the wonderfulness of the days leading up to today). 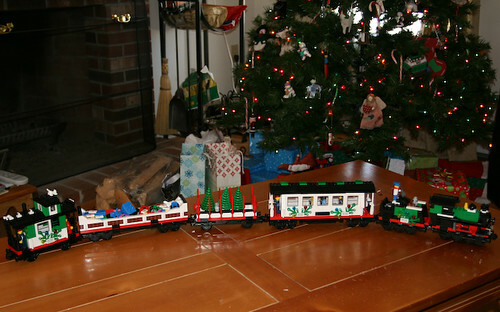 Well, Junior and I spent 2 days building the Lego Christmas train that I got on sale. It arrived on Saturday, and we built it most of the day Saturday and finished it yesterday. It’s a really fantastic train, but doing a thousand piece puzzle trying to find the pieces. 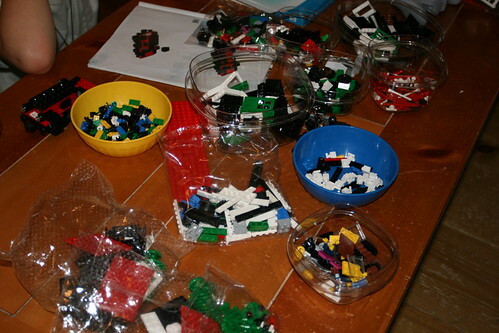 We used every bowl/container we had to put the pieces in. You get a dozen bags of Legos, but the bags aren’t broken down by train car. So you put everything in bowls so you can paw through it. But I think the final product is worth the effort. I think there are a few things that I am not going to get from Santa that I see people getting all time time in television commercials. I like television commercials because they really do tell me how much my life stinks, and how very much improved my life could be if I would just get off the couch, roll over to the mall and spend my hard earned cash. It’s so easy, even a child can do it. (For the record, Junior is not allowed to watch infomercials because he gets sucked in and he wants everything they sell. Right now the thing is that hydroponics herb garden. Because, you know, he needs fresh herbs. A Car. An expensive car specifically. With a giant red bow. You know, I’ve been around for quite a few years, and I can tell you that I’ve never seen a car with a giant bow on it in anyone’s driveway. And I notice things like that. Also, if Mr. Dump ever buys me a car without asking my input on make, model, color and options, he will be known from that point on as “Stumpy”. Gigantic Diamonds. Okay, this would be a very cool gift, I’ll admit. But really, I do not want our checking account drained so that I can get a rock that would look more appropriate on Wilma Flintstone. Or whoever is currently married to Donald Trump. A BBQ for tailgating. I don’t tailgate. Maybe I would if I had a portable grill that can make a 14 course dinner before the game. But I don’t have one so I will be grilled-meatless this Christmas. A hydroponics tabletop growing kit. Even if the thought of endless cherry tomatoes is appealing, I’d be all over this if I thought I could get even one good beefsteak tomato mid-winter. I don’t cook with a lot of mint, though, so I don’t know if it’s worth the investment. Vinyl siding and replacement windows. Gosh, what a thoughtful gift! Could those replacement windows come in, say, a mansion of some kind instead of my little Cape? That would be great! That’s all I have for now. If I think of more, I’ll add them today, because you know what? You are totally worth it. And if you’re looking for something uplifting to read (and like me, it’s okay if you tear up at work) I suggest reading The Gift over at Suldog’s blog. I only want a wintery mix if it involves peppermint candies and chocolate. Okay, that didn’t make a lot of sense, but I got tired of trying to think of something funny. Maybe I should not have said anything then? I’ll leave that up to you. I’m going to try to take a little movie of what my Christmas tree is currently doing. It’s blinking. But very slowly. It could blink faster but it’s hugely obnoxious. I know because it was doing it recently. (We bought a remove on-off plug thingy that you can use to plug in three strings of lights and what it does is turn them on and off at different times so it looks twinkly, but we have a pre-lit fake tree so it doesn’t twinkle, it just blinks like a crazy person. Saw the movie “Enchanted” today – it was fantastic. Highly recommend this one, especially if you have any experience watching Disney Princess movies. Here is our tree and the current fire. Note the soothing blinkage. Okay, I’m all Christmassed up now. Junior bought two presents to give to his cousins (without any input from us) so we are officially shopping for Christmas, baby! We went to Cataldos on the way home from Burlington (Mr. 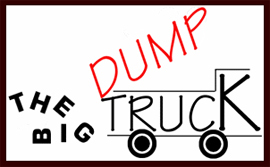 Dump needed to go to the Apple Store for work purposes. Really.) And boy howdy if that doesn’t make you feel Christmassy, nothing will. They are already selling trees so we got our first “whiff of the holidays”. I think it’s time to have the annual viewing of Little Women. But I’ll probably do it again. Last night, I, um. Well, rip it off like a bandaid, right? Last night I listened to a Christmas song on 103.3. There. I said it. I’m sorry. I learned from Universal Hub that they had stated their 24/7 Christmas music thing the other day, and I held off over 24 hours. But I gave in to the dark side on the drive home last night. Two songs, and one of them was “Do They Know It’s Christmas” which, let’s be frank, is more of an 80’s “Where are they now” game than a Christmas Carol. I changed it back to WBCN after that, but I think the damage was done, because when I got home I ripped the cellophane off Josh Groban’s “Noel” and ripped it to iTunes. I assume I’m going to give it a look-see at work today.